"At the Court of an Emperor (he lived it matters not when) there was among the many gentlewomen of the Wardrobe and Chamber one, who though she was not of very high rank was favored far beyond all the rest." "In a certain reign there was a lady not of the first rank whom the emperor loved more than any of the others." Sweet? Not really. Clear? Sharp? Yes. A Time of Day operator and an exchange name: Ah! Telephony! "This is the operator speaking"
It's the end of time, at least as far as AT&T is concerned. The brief note in customers' bills hardly does justice to the momentousness of the decision. "Service withdrawal," it blandly declares. "Effective September 2007, Time of Day information service will be discontinued." What that means is that people throughout Southern California will no longer be able to call 853-1212 to hear a woman's recorded voice state that "at the tone, Pacific Daylight Time will be . . ." with the recording automatically updating at 10-second intervals. "Times change," said John Britton, an AT&T spokesman. "In today's world, there are just too many other ways to get this information. You can look at your cellphone or your computer. You no longer have to pick up the telephone." No, you don't. But I think King Lear put it best: "O reason not the need!" Reading about the Time of Day service led me to a wonderful page with MP3s of Jane Barbe, "The Telephone Lady," whose voice I still hear when I use my long-distance card (just 3¢ a minute!). "How different our lives would be if we were newscasters." Too many teenagers are damaging their health by not getting enough sleep and by falling asleep with electrical gadgets on, researchers say. . . . The Sleep Council, which conducted the poll of 1,000 teenagers, says gadgets in bedrooms such as computers and TVs are fuelling poor quality "junk sleep". . . . Almost a quarter of the teens surveyed admitted they fell asleep watching TV, listening to music or with other equipment still running, more than once a week. . . .
Dr Chris Idzikowski of the Edinburgh Sleep Centre said: "This is an incredibly worrying trend. What we are seeing is the emergence of 'Junk Sleep' — that is sleep that is of neither the length nor quality that it should be in order to feed the brain with the rest it needs. Youngsters need to be taught a healthy lifestyle includes healthy sleep as well as healthy food. The message is simple: switch off the gadgets and get more sleep." Get some sleep, kids. But not in class. Excerpts of his poems will appear in 18 short promotional spots — like commercials for verse — on the channel and its Web site (mtvu.com, which will also feature the full text of the poems). . . .
Mr. Ashbery, who was the poet laureate of New York State from 2001 to 2003, was immediately receptive. "It seemed like it would be a chance to broaden the audience for poetry," he said. The poems used in the campaign span his career, and the spots are simple: on a white background, black text floats in to a sound like a crashing wave, appears on the screen for a minute, then floats away. From "Retro" (2005): "It's really quite a thrill/When the moon rises over the hill / and you've gotten over someone / salty and mercurial, the only person you've ever loved." From "Soonest Mended" (2000): "Barely tolerated, living on the margin / In our technological society, we are always having to be rescued" . . . . But Mr. Friedman is optimistic that verse will find its new audience, and mtvU plans to continue the program with other laureates after Mr. Ashbery's one-year tenure is up. 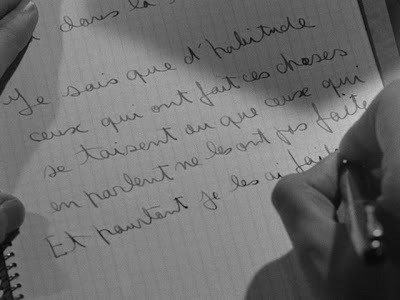 Jules Dassin's Rififi led me to Robert Bresson's Pickpocket (1959), with its dazzling silent stretches of intricate criminal choreography. 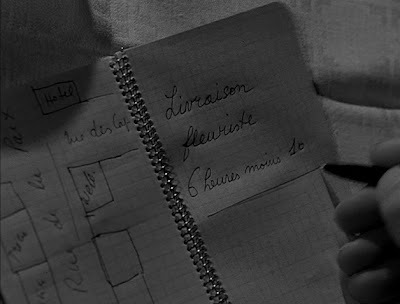 Pickpocket is my second Bresson film. 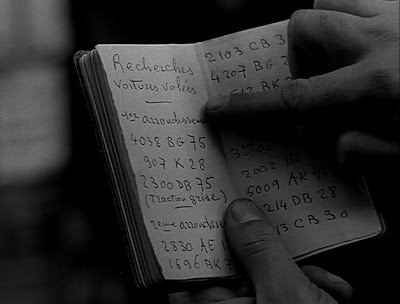 As in Diary of a Country Priest (1951), a notebook grants access to the protagonist's inner life. A pattern? I must see more Bresson. [T]here was applied to her lips a smile that did not belong to her personally, a smile I had already seen on certain people when they said to Bergotte, with a knowing air, "I've bought your book, it's tremendous," one of those collective, universal smiles that, when they have need of them — just as we make use of the railway and of moving vans — individuals borrow, except for a few ultra-refined ones, such as Swann or M. de Charlus, on whose lips I have never seen that particular smile settle. I've been told many times that I have a nice smile, and I have to believe that the tellers are telling the truth as they see it. But I don't have nice teeth. Two upper teeth tilt backwards, badly maloccluded, barely visible, giving my open-mouthed smile a gappy (albeit symmetrically gappy) look. So when a shutter snaps, I tend to zip my lips. I sometimes think about getting these teeth capped, but they've been with me so long that I find it difficult to imagine alterations. Besides, I am told that I have a nice smile. These are the only references to Sheldon Estrin that I can find online, aside from a current listing in what appears to be a clearinghouse for cut-rate dental plans. I wish Dr. Estrin's current patients better luck than I had. Yes, my dowdy farms are straight outta Calverton, as Elaine immediately recognized. Well, I write about what I know, or what I don't. What can I say? I like these cameo appearances. Rififi (1955) is an extraordinary movie by then-blacklisted Jules Dassin, director of The Naked City (1948) and Night and the City (1950). I'd liken Rififi to John Huston's The Asphalt Jungle (1950), another story of a perfect crime gone awry. The break-in and get-away sequences in Rififi offer 31 minutes without dialogue or music, only the sounds of a criminal masterpiece in progress. One in four U.S. adults say they read no books at all in the past year, according to an Associated Press-Ipsos poll released Tuesday. . . . The survey reveals a nation whose book readers, on the whole, can hardly be called ravenous. The typical person claimed to have read four books in the last year — half read more and half read fewer. Excluding those who had not read any, the usual number read was seven. "I just get sleepy when I read," said Richard Bustos, a habit with which millions of Americans can doubtless identify. Bustos, a 34-year-old project manager for a telecommunications company, said he had not read any books in the last year and would rather spend time in his backyard pool. Charless in Tallahassee left a link to this photograph in a comment on a pencil-related post. Every year a number of festivals are held within the parish: Moniaive Horse Show, Gala Day, Arts Association exhibition, Beer and Food festival, Comedy nights, Moniaive Folk Festival, Horticultural show, to name but a few. In 2004 The Times described the village as one of the "coolest" in Britain. I'm unable to find any suggestion of Moniaive's connection to pencils. 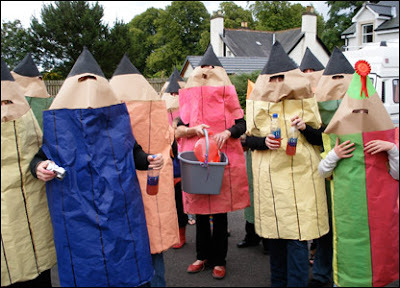 But when has one needed a special reason to dress up as a pencil? When it comes to reading, lifehacking tends to focus on speed — more words, fewer minutes. That might be fine if reading is understood as a matter of moving information with maximum efficiency from the page to the brain. The faster the connection, so to speak, the better. But there are other kinds of reading. No one can race through a poem by Emily Dickinson or a short story by James Joyce and take away very much from the experience. Therein lies a problem for students reading literary works. On the one hand, there's the impulse to get through an assignment, to knock off a poem or story and move on to another task. On the other hand, there's the poem or story, the kind of text that invites and rewards patient attention. My advice: slow down. Here's what the poet Ezra Pound says about reading literature: "no reader ever read anything the first time he saw it." Or consider this exchange between Oprah Winfrey and the novelist Toni Morrison: "Do people tell you they have to keep going over the words sometimes?" "That, my dear, is called reading." Or as the poet William Carlos Williams says in the poem "January Morning,"
an amateur musician who sits at the piano, has a piece of music, which is the work, made by somebody they don't know, who they probably couldn't comprehend entirely, and they have to use their skills to play this piece of music. The greater the skill, the greater the gift that you give the artist and that the artist gives you. That's the incredibly unfashionable idea of reading. And yet when you practice reading, and you work at a text, it can only give you what you put into it. It's an old moral, but it's completely true. Taking the time to slow down — marking a passage, pondering a detail, looking up a word, writing down a question, changing your mind, looking at the page in a way that allows you to begin to notice what's there — might change, for keeps, your idea of what it means to read literature. Slowing down will also help you begin to understand how it is that some people seem to see so much in what they're reading. They know that reading well sometimes means taking your time. Proust succeeded because he had no public ambitions — no reason to believe that the sound of the name "Guermantes" would mean anything to anybody but his narrator. If that same name does in fact have resonance for lots of people nowadays, that is just because reading Proust's novel happens to have become, for those people, the same sort of thing which the walk à côté de Guermantes happened to become for Marcel — an experience which they need to redescribe, and thus to mesh with other experiences, if they are to succeed in their projects of self-creation. When I switched from Windows XP to Mac OS X, I decided not to install Microsoft Office on my new computer. I chose instead to go with Apple's sleek and beautiful iWork. iWork is not an Office-clone or Office-killer; it's a set of three elegantly-designed programs: Pages, for word-processing and document design; Keynote, for presentations; and Numbers, for spreadsheets. I spend most of my time in Pages and plan to keep my gradebook in Numbers. I am happy. 1. From the Pages toolbar or from Insert, choose Text Box. 2. Replace the words "Type to enter text" with the capital letter of your choice. 3. Highlight the letter that you've added and choose an appropriate font and size. Doing so will probably involve some trial and error. 4. Left-click outside and then inside the text box to show its borders. 5. Resize the text box. Here too, expect some trial and error. 6. 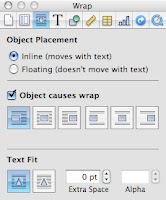 With the borders of the text box still showing, open the Inspector (from the Pages toolbar or from View > Inspector) and choose Wrap Inspector, the third icon from the left. 7. For Object Placement, select "Inline (moves with text)." 8. Check "Object causes wrap" and select the icon on the far left. 10. Now position the text box in your document. Depending upon the letter (or numeral) you're dropping in, you might need to tinker by changing Object Placement to Floating and moving your text box (then switching back to Inline). Or you might need to change the Extra Space setting. Getting things right here may prove tedious. But I think that the drop-cap effect is worth the effort. A one-hour broadcast, from the series Radio Lab. Includes a segment with Jonah Lehrer, author of the forthcoming Proust Was a Neuroscientist. I discovered these balloons in the backyard this morning. Was someone trying to brighten our empty nest? No. The card attached was addressed to the "Bus Garage Office": "Thanks for another smooth start." 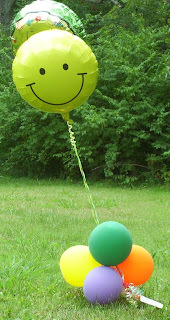 As I learned when I called the flowershop, these balloons were delivered yesterday. The schoolbus company has its office on the outskirts of town. These balloons must have traveled about four miles to show up in our backyard. Elaine has posted a photograph. I remembered yesterday an exchange that took place nineteen summers ago. I was at a gathering for participants in an NEH seminar and their families. As my daughter Rachel, then one-and-a-half, toddled around, a fellow seminar member said to me, "They're such a nuisance, aren't they?" The so-called lemonade that I wrote about about last week has continued to occupy my thought process. So I e-mailed Supervalu to ask (politely) how the words "old-fashioned recipe" apply to the product in question, a blend of water, chemicals, and dye. Days went by without a reply, so I tried again and was told that my comments had been forwarded to the manufacturer and that I could expect a reply soon. In today's mail, a polite non-answer ("Your comments are being forwarded to Our Own Brands Product Developers for their consideration"), along with $4 in coupons. "The staff at Owens Funeral Home invites you to join them . . ."
". . . in supporting public radio." My son Ben asked for a family game of Cranium before heading off to college. 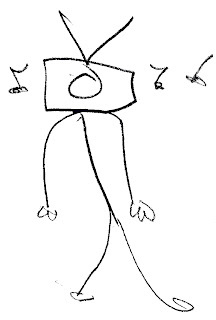 The picture to the left comes from that game, from a Sensosketch challenge, requiring the player to draw with eyes closed. Ben drew, no peeking allowed. His sister Rachel had the answer at once. Ben embellished the picture a bit in the post-game hubbub. What answer was Ben's picture meant to elicit? Fifty — no, make that one-hundred bonus points and a free extra turn for the first commenter to get it. The hint accompanying this Cranium challenge: band. Max Roach, a founder of modern jazz who rewrote the rules of drumming in the 1940's and spent the rest of his career breaking musical barriers and defying listeners' expectations, died early today in Manhattan. He was 83. . . .
Over the years he challenged both his audiences and himself by working not just with standard jazz instrumentation, and not just in traditional jazz venues, but in a wide variety of contexts, some of them well beyond the confines of jazz as that word is generally understood. . . .
Mr. Roach explained his philosophy to The New York Times in 1990: "You can't write the same book twice. Though I've been in historic musical situations, I can't go back and do that again. And though I run into artistic crises, they keep my life interesting." If you've never heard Max Roach, try Money Jungle, with Duke Ellington and Charles Mingus. Mme Verdurin did not give "dinners," but she had "Wednesdays." Her Wednesdays were a work of art. While knowing that there was nothing to equal them elsewhere, Mme Verdurin introduced fine distinctions between them. "This last Wednesday wasn't up to the one before," she would say. "But I think the next'll be one the most successful I've ever given." She sometimes went so far as to confess: "This Wednesday wasn't worthy of the others. In return, I've got a big surprise for you the one after that." In the final weeks of the season in Paris, before leaving for the country, the Patronne would announce that the Wednesdays were ending. It was an opportunity to spur on the faithful: "There are only three Wednesdays left, there are only two more," she would say, in the same tone of voice as if the world were about to end. "You're not going to let me down next Wednesday for the closure." But this closure was a sham, for she would warn them: "Now, officially, there are no more Wednesdays. That was the last for this year. But I shall be here all the same on Wednesdays. We'll have Wednesday among ourselves. Who knows? These little intimate Wednesdays will perhaps be the pleasantest. At La Raspalière, the Wednesdays were necessarily restricted, and since, according as some friend had been met with when passing through and had been invited for one evening or another, almost every day was a Wednesday. No it's not gonna drop in. Thomas and Mary Anne Clearwater. Oikos (οίκος) is one of my favorite ancient Greek words. Its meanings include house, dwelling, household, and family (as in "the house of Atreus"). 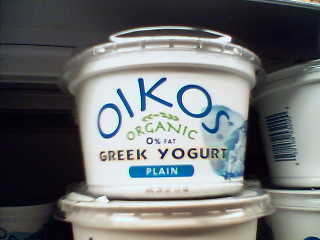 Oikos is the source of ec- and eco-, as in ecology and economics. It's a key word in Homer's Odyssey, which is about finding one's way back home. The cover of Stanley Lombardo's translation of the Odyssey makes this point beautifully, with a cropped version of "Earthrise," an Apollo 8 photograph of our one oikos, taken as the astronauts orbited the moon. When the Odyssey begins, Odysseus may as well be on the moon: stuck on Calypso's island, he has been removed from all possibilities of human culture. A suggestion for improving the quality of life: add air to your car's tires by using a pump. Consider the advantages: No waiting for the gas station's air hose. No arduous maneuvering to get close enough to the air hose. No quarters. No racing from tire to tire as time runs out. No driving off with grimy hands. And a modest addition to the day's physical activity. All steel joint intake valve. Produces 200 pounds of pressure. Intake valve designed to permit cylinder to fill with air on upward stroke with no back pressure. 30" hose with storage clip. Hose features easy thumb lock connector. Zinc die cast top and bottom caps. 1 3/8" x 20 3/8" heavy gauge steel cylinder, with copper bronze finish. Overall length is 24 1/2". Large, comfortable solid wood handle. Replacement hose complete with thumb lock connector and hose clamp available. The Goldenrod pump is made in the States. It lists for $56.99 ($37.99 from Amazon). Family Communications, the organization that brings us Mister Rogers' Neighborhood, has a succinct and convincing reply to the assertion in a recent Wall Street Journal article that Fred Rogers is to blame for runaway self-esteem among young adults. How exciting (to me, anyway) to discover that a pencil manufacturer employed a cartoon spokescharacter. Meet Mr. T, who represented Dixon Ticonderoga pencils. I found this image (from a 1957 magazine ad) in Warren Dotz and Masud Husain's Meet Mr. Product (San Francisco: Chronicle, 2003). "The difference on this program is that everybody corpses, and there's no one worse than Ricky." corpse, v. Actors' slang. To confuse or 'put out' (an actor) in the performance of his part; to spoil (a scene or piece of acting) by some blunder. 1873 Slang Dict., Corpse, to stick fast in the dialogue; to confuse or put out the actors by making a mistake. [2.] b. intr. Of an actor: to forget one's lines; = DRY v. 2 d; to spoil one's performance by being confused or made to laugh by one's colleagues. 1874 HOTTEN Slang Dict., Corpse, to stick fast in the dialogue. 1958 News Chron. 23 May 4/7 There's a new word, too, from drama school. When anyone forgot their lines in the past they had dried. Today, they have 'corpsed'. 1972 A. BENNETT Getting On I. 32 Mrs Brodribb: When Max —. Geoff: Max (He corpses). Mrs Brodribb: (silencing him with a look) — pauses by your doorstep he is not just relieving himself. He is leaving a message. 1987 Observer 8 Feb. 11/2 Gambon said his dying line ('Oh, I am slain') in the mode of a different theatrical grandee every night — a display of 'suicidal nerve', all to get his co-actor to corpse in the dark. It's the most recent meaning of the word that's relevant to Extras, though here it's the corpsing performer him- or herself who takes the blame for failing to keep a straight face. The short feature The Art of Corpsing features Ricky Gervais and Stephen Merchant and company corpsing — in take after take after take — and talking about corpsing. One realizes, watching these efforts, how much dedicated work goes into what appears to be the most casual, low-key kind of comedic acting. Odette has alerted her readers to a Proust tour to Paris, Illiers-Combray and Cabourg (the novel's Balbec). It's too late for this year's trip, which took place in June. Interested parties might begin saving for next summer ($3,675). Reading the madeleine excerpt from Swann's Way while you sip tea and take a bite of your madeleine in Illiers-Combray. Standing in the lobby of the Grand Hotel in Cabourg (Balbec) with a view of the beach. Unforgettable experiences that bring Proust's prose to life. Well, maybe. What brings Proust's prose to life for me is recognizing the Proustian workings of memory and perception in my own life. Eating a madeleine would bring me no closer to Proust than eating red beans and rice would to Louis Armstrong.¹ But drinking a glass of water and being reminded of my grandparents' kitchen — that, for me, is a genuinely Proustian moment. There were glass shards, chandelier crystals, a sheriff's badge, old coins, wind-up metal toys from early in the century. Knowing how much Cornell loved such objects, Saunders plunked down the box on the kitchen table, removed its contents, and generously said, "You can have everything!" Cornell appeared astounded. "Oh no, Mr. Saunders," he protested, "I couldn't take these. This is your marvelous collection." So too it's Proust's marvelous madeleine, the trigger for his involuntary memories. Yours, or mine, might be found closer to home. ¹ Red beans and rice was a signature Armstrong dish. 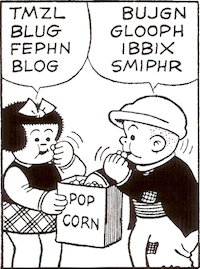 He often signed letters "Red beans and ricely yours." Highway Gothic conjures the awe of Interstate travel and the promise of midcentury futurism; Clearview's aesthetic is decidedly more subdued. "It's like being a good umpire," [highway engineer Martin] Pietrucha says, suggesting that one of Clearview's largest triumphs will be how quietly it replaces Highway Gothic sign by sign in the coming years. "It will completely change the look of the American highway, but not so much that anyone will notice." Driving east in Pennsylvania last week, I noticed the Trebuchet-like curl in the lower-case l (i.e., el), but I didn't realize that the change was more than local. Erin at Vegan Restaurants Master List is contacting the corporate headquarters of restaurant chains to ask "What's vegan?" Erin's blog is a great resource for anyone who's vegan (or aspires to be). But it's good reading too for anyone with an interest in seeing how corporations respond to friendly questions from customers and potential customers. The responses range from helpful and well-informed (Chili's) to highly evasive (Jimmy John's). It's remarkable how little the people who run restaurants sometimes know about what they're serving. A few days ago, when I asked the manager of a Taco Bell if the rice was vegan, she laughed and said she had "no idea." Is Jimmy John's bread vegan? (TO PROTECT FLAVOR), YELLOW 5. How many lies do you count? We heard a few reports, in one case corroborated by photographs, that some soldiers had so lost their moral compass that they'd mocked or desecrated Iraqi corpses. One photo, among dozens turned over to The Nation during the investigation, shows an American soldier acting as if he is about to eat the spilled brains of a dead Iraqi man with his brown plastic Army-issue spoon. . . . The scene, Sergeant [Camilo] Mejía said, was witnessed by the dead man's brothers and cousins. And no way to keep the dogs off your head." Standing on Troy's wall, Hector's father and mother witness Achilles' treatment of their son's body, groaning and screaming as they watch. And here we are, twenty-seven centuries later, in the same story. A (section of) river capable of powering machinery, as for a mill, factory, etc. ; = water-privilege. This watery meaning is American in origin and now considered obsolete. He paced the bank of the noisy little ‘privilege’ that turned the gristmill. Solvent cups are great for packing vitamins, meds, and other small items. Ashland, Ohio, claims to be "the world headquarters of nice people." Jesse's Café (139 Brighton Ave, Long Branch, New Jersey) is a wonderful mostly-vegan restaurant. The baba ghanoush is spectacular. Ratatouille is a noun made from two verbs: ratouiller (to disturb, shake) and tatouiller (to stir). Manhattan Special is an espresso soda from Brooklyn, New York, bottled since 1895. It is everything Coke Black wants (and fails) to be. Older wine — a 1989 Bordeaux, almost brown in color, earthy in taste — is very different from the 2005, 2006 stuff I buy. Fuller's earth is a special-effects material used in simulating explosions. When you see the dirt flying up in a big plume, that's Fuller's earth. Desert Spring is a house-brand imitation of Poland Spring. Rob Zseleczky can play a note-perfect guitar part for "Scarborough Fair." My sister-in-law Susie can draw manga characters. Most events in one's life happened "fifteen or twenty years ago." Singing along with Pete Seeger while driving lightens and brightens all moods. Coming back is so much nicer when the house is decluttered. People, even those that we love the most, may, it is true, become saturated by the sadness or irritation that emanates from us. There is one thing, however, capable of a power of exasperation to which no human being will ever attain: a piano. Spend any length of time reading about Proust and you'll hear that his writing is addictive. In fact, the ubiquity of this claim was something I found off-putting. Novels aren't heroin or peanut M&Ms, after all. To me it sounded like so much hyperbole, and as a book reviewer I've sprayed around too much of that myself to fall for anyone else's. But after reading The Guermantes Way I'm beginning to see some sense in the claim. "I didn't want to be the guy who woke when he was sixty-five, and said 'Gee, I forgot to have kids.' I mean, somebody took the time to have us, right?" Mr. Van Nostrand walked over to a framed floral arrangement. "This is seaweed. Aunt Gertrude used to have it sent in from the Jersey coast, then she arranged it in the form of flowers and pasted it on heavy drawing paper." "You'll find them all over the house," commented Mrs. Lonnberg. "Making flowers out of seaweed was Aunt Gertrude's life," said Mr. Van Nostrand. Reading Merlin Mann's post on clutter last month inspired me to see and clean up my clutter. Something that has helped tremendously: Peter Walsh's It's All Too Much: An Easy Plan for Living a Richer Life with Less Stuff, a book with significant psychotropic power. The most important point Walsh makes is that "organizing" stuff — by buying more boxes and bookshelves — never solves the problem. The real solution is rethinking one's relationship to stuff, an activity that can feel quite freeing. My own efforts in this regard are ongoing. But already my workspace, our house, and life in general are a lot more comfortable and inviting.